This pump embodies the traditional design style of a high pressure grout and cement slurry pump — its all steel construction provides superior strength, durability and reduced maintenance costs compared to cast iron and aluminum pumps. The heavy-duty design and construction of ConMico's injection pumps are engineered and crafted to provide years of productive operation and can be field maintained with ease. This versatile steel double acting pump is an ideal solution for applications requiring continuous high pressure — it provides greater throughputs at proportionately higher pressures — all with lower energy requirements. The opposing cylinders provide an even flow of material at a consistent high pressure. The unit includes a hydraulic end specifically built for easy cleaning and maintenance with the application of SUPER STAKO STAPLE joints. 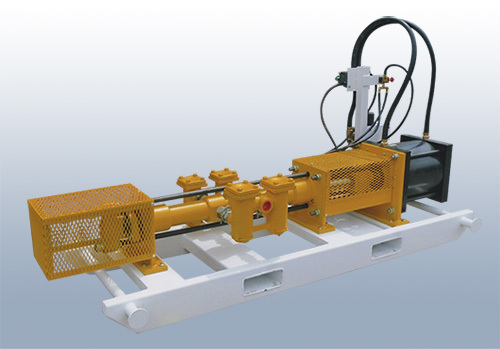 Model 2500 Pneumatic Cement Injection Pump — available as a stand-alone system or incorporated into a dedicated grouting plant.